Here at Schaeffer Precision part of our every day tool is the laser tracker. We use it for a wide variety of applications across just about any industry. It is an extremely versatile piece of equipment. We’ve been using laser trackers for many years and seen how the precision and accuracy of the machinery has improved with modern technology. For today’s blog we’re citing Bob Bridges article on Quality Digest called How Laser Trackers Work. In this article, Bob breaks down the complexities of the laser tracker and gives details that even a layman would understand. You can read the article in its entirety at this link. How Do Laser Trackers Work? The operation of a laser tracker is easy to understand: It measures two angles and a distance. The tracker sends a laser beam to a retro-reflective target held against the object to be measured. Light reflected off the target retraces its path, re-entering the tracker at the same position it left. Retro-reflective targets vary, but the most popular is the spherically mounted retro-reflector (SMR). As light re-enters the tracker, some of it goes to a distance meter that measures the distance from the tracker to the SMR. The distance meter may be either of two types, interferometer or absolute distance meter (ADM). A laser tracker contains two angular encoders. These devices measure the angular orientation of the tracker’s two mechanical axes: the azimuth axis and the elevation (or zenith) axis. The angles from the encoders and the distance from the distance meter are sufficient to precisely calculate the center of the SMR. Because of the spherical design of the SMR, its center is always at a fixed offset distance with respect to any surface being measured, so the coordinates of surfaces or points measured with the SMR are easily obtained. Distance measurement, an important function of the laser tracker, can be either incremental or absolute. Incremental distance measurement is made with an interferometer and a frequency-stabilised, helium-neon laser. The laser light splits into two beams. One travels directly into the interferometer. The other beam travels out of the tracker, reflects off the SMR and, on the return path, passes into the interferometer. Inside the interferometer, the two beams of light interfere, resulting in a cyclic change each time the SMR moves closer to or farther from the tracker by a distance equal to one quarter of the light’s wavelength (~0.0158 micron). Electronic circuitry counts the cyclic changes (known as “fringe counts”) to determine the distance traveled. In a typical measurement sequence, the operator places the SMR in the tracker’s home position and resets the interferometer to the known (home) distance. As the operator moves the SMR to the desired location, the laser tracks along, remaining fixed to the centre of the SMR. This procedure works well as long as the beam from the tracker to the SMR isn’t broken by an obstruction in the beam path. If the beam is broken, however, the number of counts is no longer valid and the distance isn’t known. When this happens, the tracker signals that an error has occurred. The operator must then return the SMR to a reference point, such as the tracker’s home position. Absolute distance measurement capability has been around for a long time. Within the last 10 years, however, ADM systems have undergone dramatic improvement, offering accuracy comparable to interferometers. The advantage of ADM measurement over incremental distance measurement is the ability simply to point the beam at the target and shoot. The ADM system measures the distance to the target automatically, even if the beam has previously been broken. In a tracker with ADM, infrared light from a semiconductor laser reflects off the SMR and re-enters the tracker, where it’s converted into an electrical signal. Electronic circuitry analyses the signal to determine its time of flight, multiplying this value by the speed of light in air to determine the distance from the tracker to the SMR. Absolute-distance meters first appeared in laser trackers in the mid-1990s. At that time, ADM units measured too slowly to permit scanning of surfaces. Because of this, all early laser trackers contained either an interferometer alone or an interferometer and an ADM. Today, some absolute-distance meters have been made fast enough to permit high-speed scanning with negligible loss in accuracy. Hence, some modern trackers contain only an ADM with no interferometer. Another tracker function is beam steering and control. One type of tracker launches the laser beam directly from its rotating structure. Another type of tracker reflects a laser beam off a rotating mirror. 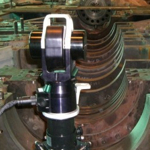 In either case, the tracker points the laser beam in the desired direction by rotating the mechanical axes. In many applications, the tracker keeps the beam centered on a rapidly moving SMR. It accomplishes this by splitting off part of the returning laser beam to a position-sensing detector (PSD). If the laser beam strikes the SMR off center, the split-off beam also strikes the PSD off center, creating an error signal. This signal controls the mechanical axes’ rotation to keep the beam centred on the SMR.